Background: There are a great number of tools that can be used in QSAR/QSPR studies; they are implemented in several programs that are reviewed in this report. The usefulness of new tools can be proved through comparison, with previously published approaches. In order to perform the comparison, the most usual is the use of several benchmark datasets such as DRAGON and Sutherland’s datasets. Methods: Here, an exploratory study of Atomic Weighted Vectors (AWVs), a new tool useful for drug discovery using different datasets, is presented. In order to evaluate the performance of the new tool, several statistics and QSAR/QSPR experiments are performed. Variability analyses are used to quantify the information content of the AWVs obtained from the tool, by means of an information theory-based algorithm. Results: Principal components analysis is used to analyze the orthogonality of these descriptors, for which the new MDs from AWVs provide different information from those codified by DRAGON descriptors (0-2D). 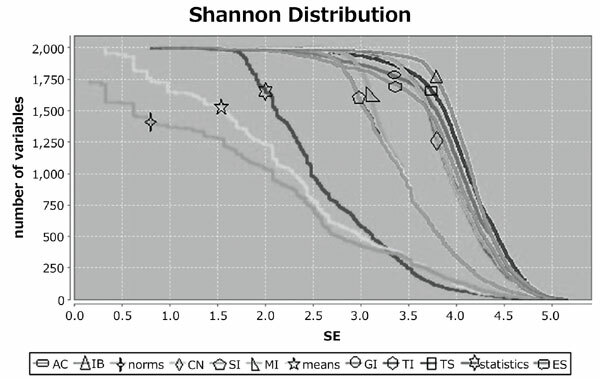 The QSAR models are obtained for every Sutherland’s dataset, according to the original division into training/test sets, by means of the multiple linear regression with genetic algorithm (MLR-GA). These models have been validated and compared favorably to several previously published approaches, using the same benchmark datasets. Conclusion: The obtained results show that this tool should be a useful strategy for the QSAR/QSPR studies, despite its simplicity. Keywords: Aggregation, Atomic weighted vector, Multiple linear regression, Operator, Principal components analysis, QSAR, Variability. Keywords:Aggregation, Atomic weighted vector, Multiple linear regression, Operator, Principal components analysis, QSAR, Variability. Abstract:Background: There are a great number of tools that can be used in QSAR/QSPR studies; they are implemented in several programs that are reviewed in this report. The usefulness of new tools can be proved through comparison, with previously published approaches. In order to perform the comparison, the most usual is the use of several benchmark datasets such as DRAGON and Sutherland’s datasets.